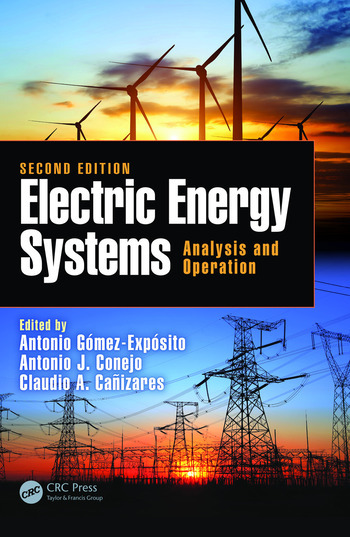 Electric Energy Systems, Second Edition provides an analysis of electric generation and transmission systems that addresses diverse regulatory issues. It includes fundamental background topics, such as load flow, short circuit analysis, and economic dispatch, as well as advanced topics, such as harmonic load flow, state estimation, voltage and frequency control, electromagnetic transients, etc. The new edition features updated material throughout the text and new sections throughout the chapters. It covers current issues in the industry, including renewable generation with associated control and scheduling problems, HVDC transmission, and use of synchrophasors (PMUs). The text explores more sophisticated protections and the new roles of demand, side management, etc. Written by internationally recognized specialists, the text contains a wide range of worked out examples along with numerous exercises and solutions to enhance understanding of the material. Integrates technical and economic analyses of electric energy systems. Addresses renewable generation and the associated control and scheduling problems. Analyzes electricity markets, electromagnetic transients, and harmonic load flow. Features new sections and updated material throughout the text. Includes examples and solved problems. Antonio Gómez-Expósito received a six-year industrial engineer degree, major in electrical engineering, in 1982, and a PhD in 1985, both with honors from the University of Seville, Spain. He is currently the Endesa Red chair professor at the University of Seville, where he chaired the Department of Electrical Engineering for nearly 12 years and the Post-Graduate Program on Electrical Energy Systems. In the late 1980s he created, and still leads, the Power Engineering group, currently comprising about 30 researchers, including 20 doctors. He was also a visiting professor in California and Canada. Professor Gómez-Expósito has coauthored several textbooks and monographs about circuit theory and power system analysis, of which the one published by Marcel Dekker, Power System State Estimation: Theory and Implementation, stands out. He is also the coauthor of over 300 technical publications, nearly one half of them in indexed journals. He has been the principal investigator or participated in over 80 research and development projects, both publicly and privately funded, most of them developed in close cooperation with the major national and European companies of the electrical sector. In 2012, he led the creation of the spin-off company Ingelectus. Professor Gómez-Expósito has served on the editorial board of the IEEE Transactions on Power Systems and other journals, and has also belonged to the scientific or technical committees of the major European conferences related to power systems in the last 20 years. Among other recognitions, he received in 2011 the "Juan López Peñnalver" Research and Technology Transfer Award, granted by the Government of Andalusia, and the Outstanding Engineer Award, granted by the Spanish Chapter of the IEEE/PES in 2010. He is a fellow of the IEEE and a member of the Royal Sevillian Academy of Sciences. Antonio J. Conejo, Professor at the Ohio State University, OH, USA, received a BS from University P. Comillas, Madrid, Spain, an MS from Massachusetts Institute of Technology, USA, and a PhD rom the Royal Institute of Technology, Sweden. He has published over 190 papers in SCI journals and is the author or coauthor of books published by Springer, John Wiley, McGraw-Hill, and CRC. He has been the principal investigator of many research projects financed by public agencies and the power industry and has supervised 20 PhD theses. He is an IEEE Fellow and a former editor-in-chief of the IEEE Transactions on Power Systems, the flagship journal of the power engineering profession. Claudio A. Cañizares is a full professor and the Hydro One endowed chair at the Electrical and Computer Engineering (E&CE) Department of the University of Waterloo, where he has held various academic and administrative positions since 1993. He received the electrical engineer degree from the Escuela Politécnica Nacional (EPN) in Quito-Ecuador in 1984, where he held different teaching and administrative positions between 1983 and 1993, and his MSc (1988) and PhD (1991) in electrical engineering are from the University of Wisconsin-Madison. His research activities focus on the study of stability, control, optimization, modeling, simulation, and computational issues in large as well as small grids and energy systems in the context of competitive energy markets and smart grids. In these areas, he has led or been an integral part of many grants and contracts from government agencies and private companies, and has collaborated with various industry and university researchers in Canada and abroad, supervising/co-supervising a large number of research fellows and graduate students. He has authored/co-authored many highly cited journal and conference papers, as well as several technical reports, book chapters, disclosures and patents, and has been invited to make multiple keynote speeches, seminars, and presentations at numerous institutions and conferences worldwide. He is a fellow of the IEEE, as well as a fellow of the Royal Society of Canada, where he is currently the director of the Applied Science and Engineering Division of the Academy of Science, and a fellow of the Canadian Academy of Engineering. He is also the recipient of the 2017 IEEE Power & Energy Society (PES) Outstanding Power Engineering Educator Award, the 2016 IEEE Canada Electric Power Medal, and of various IEEE PES Technical Council and Committee awards and recognitions, holding leadership positions in several IEEE-PES Technical Committees, Working Groups, and Task Forces.